59 Port Tack in Palmetto Dunes. 5 bedrooms and 5.5 baths. 2 king master suites with bubble tubs and steam showers.Both have 50' flat screens. Back porch with rockers overlooking pool with spa. Large patio with built in barbecue with bar top for outdoor entertaining. Dock on the 11 mile lagoon system. Great for kayaking or canoeing. Downstairs: 2 bedrooms one queen and one king . Both have private baths and 42' flat screens. Kids room upstairs has three singles and one trundle(sleeps 4) and has two TVs. Family room with 48' flat screen TV, surround sound stereo. No Smoking. No Animals permitted. Wireless Internet in office which overlooks lagoon. Specials: Our home is normally a Sat to Sat rental, however from October 1st through Feb 28th we would be able to consider other date ranges. We chose Hilton Head and Palmetto Dunes specifically because of it's property management history and an excellent home owners association. The neighborhood is always in great shape! Our home is located on the 11 mile lagoon system offering direct access to water for kayaking and fishing! Two of our favorite activities. We are only 6/10th's of mile to the beach. Riding bikes on the beach is at the top of our list! We are located on the 11 mile lagoon system which winds through our plantation. We have a boat dock. Home is located on the 11 mile lagoon system. Fishing dock in backyard. The rental contract allows for two parking passes. Our drive way will hold up to 6 cars if you have visitors. You are able to rent and have kayaks delivered to our dock! Call the PD Outfitters store. Large patio around pool area. Small Deck towards the dock area. Always ranked as one of the top destinations in the world for tennis. One free hour of tennis per day with your contract. 3 kings, 1 queen, 4 twins. Full size screen with cable. Wireless Internet. 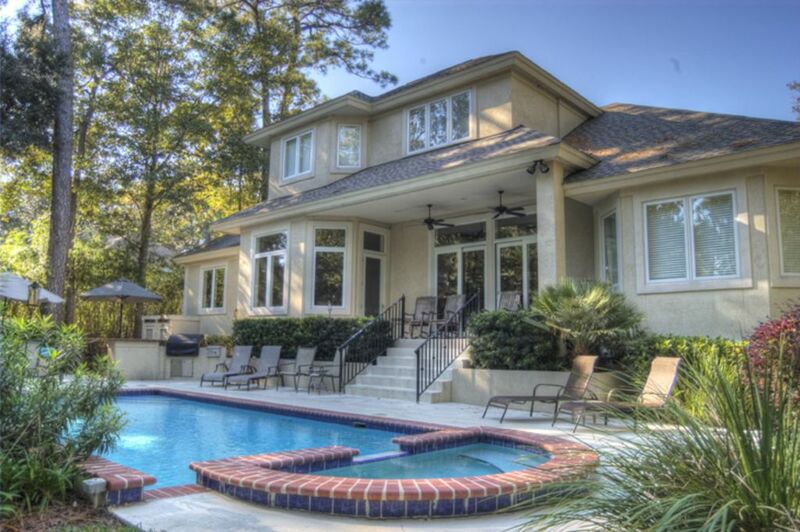 Our group greatly enjoyed the home, pool, fishing dock, and HHI. Joe was professional and prompt with all correspondence. Thank you for sharing your home! Thank you Karin for the review. My favorite spot in the mornings is the office. Cup of coffee looking out over the lagoon and backyard. Happy you found everything in order. Outstanding home. Many ammenities. Great kitchen and large table where we all could eat. Bedrooms were large, great size kitchen. Olympic size pool name just a few great things about this house. Would come back again. could not wait to get there, when we did we were so happy. it was what we expected, clean and stocked with everything we needed. went out back to see the pool and lagoon. everything was beautiful. everyone enjoyed themselves. would definitly stay again or recommend to anybody else. Beautiful home, quite area, and relaxing pool! This home had everything we needed. We will definitely be back! Thank you for spending your vacation with us. We are looking forward to seeing you again in the near future. Wonderful home for our family of eight! Our family had a great week in late March. Kids were in the heated pool everyday. Fishing on the dock in the backyard was also their favorite. They named the heron "Charlie" who was always waiting on a fish. He was there all week. Palmetto Dunes is a wonderful area, great bike paths. Home is spacious and we hope to return! Biking, canoeing, golf, kayaking, fishing, crabbing, walking, beach close by, restaurants, shopping, deep sea fishing. Deposit with booking 50%. Balance due 60 days prior to check in.